Since I appeared to have failed at the ‘only watching movies in pjs while sipping hot chocolate’ category, I did a little new old upcycled bathroom organizing. You’ve seen the master bathroom 100s of times. But only from this view. Truth is… it isn’t done. I’m going to be revamping ‘a’ bathroom and am having a hard time deciding which one. So I decided to change a few things around in this one to see if I could love it the way it is, or if it was ‘the one’ to tackle first. Here is the other side as it stands today. There use to be a tall corner cabinet on the right side of the sink, but it became too dysfunctional. I required more of a counter of sorts, so I test ran a little white bench instead. Like like like! But I think it’s a tiny bit too low so if this setup stays, I’d make a new one a bit taller, maybe with a rustic wood top and possibly a shelf underneath. I’ve never made a bench before, so I think it’s time! Maybe. This one is rather growing on me. Tip: if a room is tight for space, consider removing tall obstructions to gain more visual space. Sometimes adding tall things for storage matters more, but in this case, a countertop was more important. And it really did open up the room! 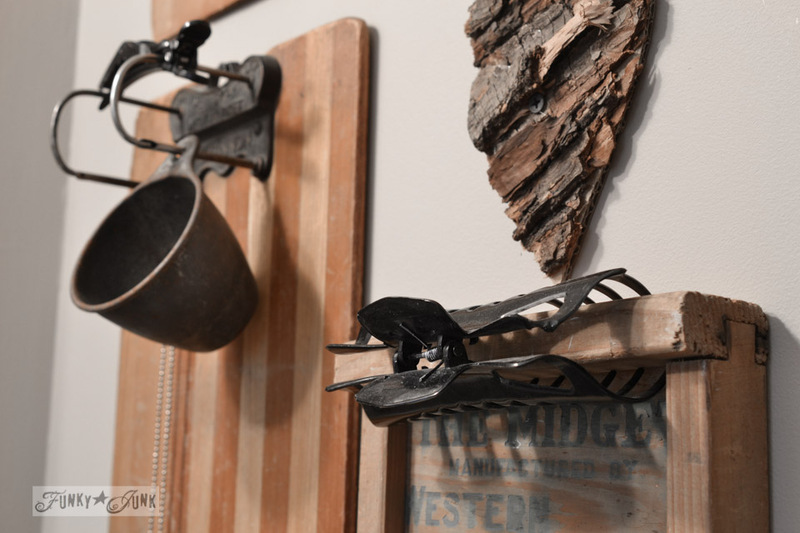 The repurposing on the wall is decorative and serves a purpose. The cup can hold loose change, the vintage bulletin board jewelry, and now I can find my hair clips. Bonus. 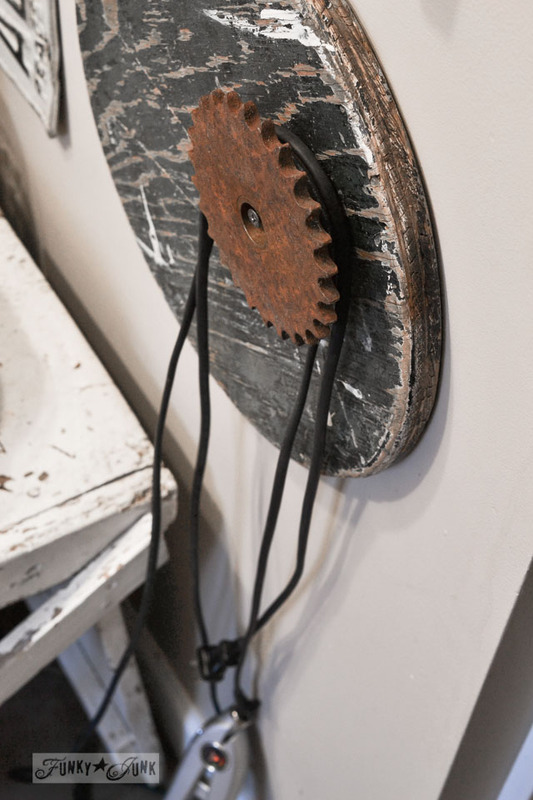 An old stool seat became a frame to a rusty old gear which is perfect to hold up my straightening iron. But I need to find a way to affix it without it coming off. I’ll figure something out. If it stays. But the personal highlight for this tour? 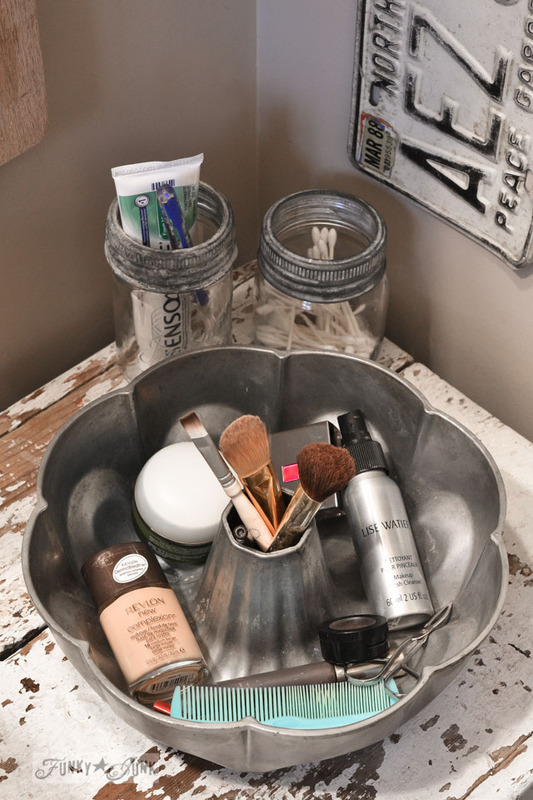 It’s the new upcycled makeup organizer, hands down. 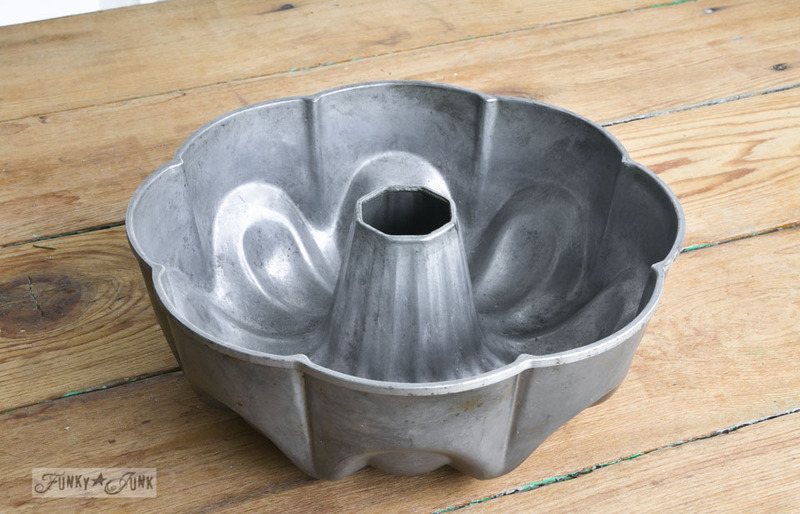 Ohhhh my goodness how perfect is this cake / bundt / whatever it is baking pan! It must be pretty old because it weights a ton. But it’s so so perfect for every day makeup. I’m liking my little revamp to this bathroom! So next up, I’m going to show you the bathroom you’ve never seen before. And get your input on which room I ought to tackle. And why I’m doing all this in the first place. Tomorrow is New Year’s Eve, so I’ll be picking up my son, and we’ll have a day of eating out and a peek in at Walter Mitty at the movies. I promise! I can do this! I really can leisure the day away doing fun stuff! I just moved into a new(to me) house in Nov. and the main bathroom is set up almost identical to yours, we have a very small vanity sink instead of the pedestal though, and we have the ugliest lights known to man installed on either side of the mirror. 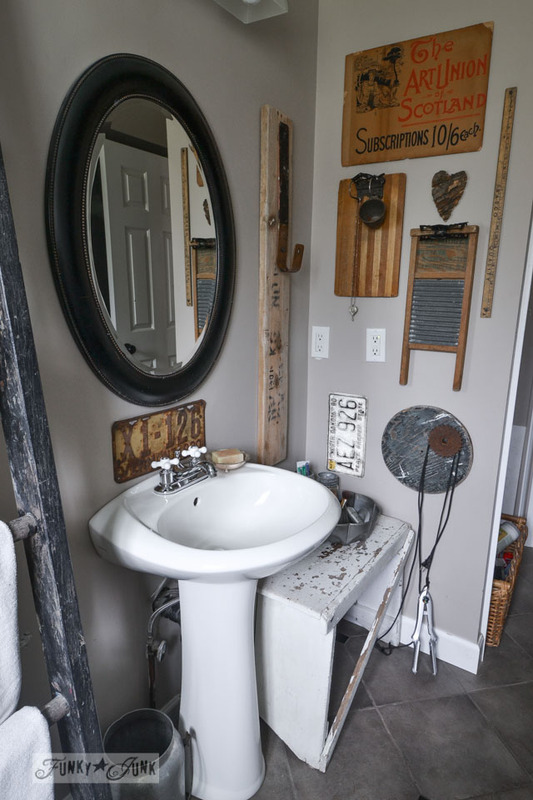 I love the idea of “junkin’ it up” to give it some personality though-thanks for the inspiration. What a cute idea! 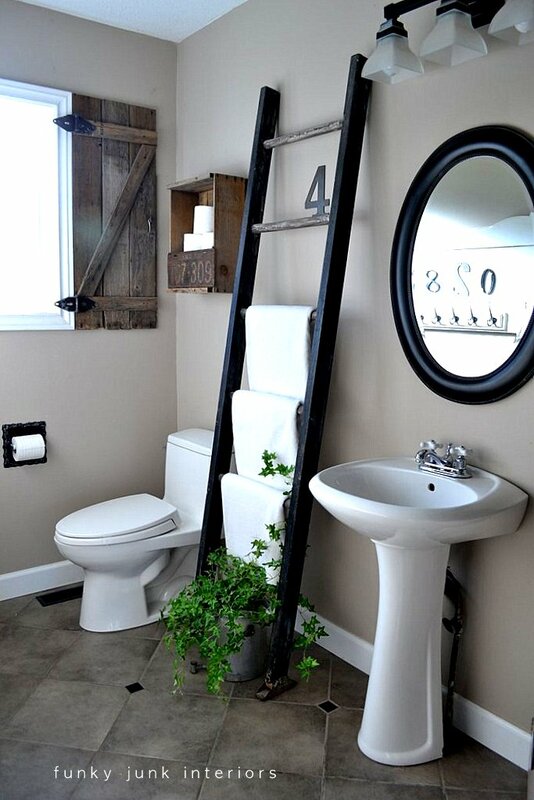 Love this repurpose!!! Why not put a shelf below the darling little bench to raise it up to counter height? Just a thought since it is so wonderful the way it is. Hmmmm will consider that Niki! My issue with the bench is the cross section that won’t allow a shelf for storage. Maybe if I open it… thanks! Will consider that! Cheers to throwing out stuff you don’t use and a very creative 2014!! I’m thinking I love the bundt pan idea! But I love all of the storage solutions in your bathroom! I love that! “…fiddling with your house.” I now have a great description of my own hobby…I just never knew! I love the bundt pan idea, just as I love all of your cleverness, but I need to find something that doesn’t take up quite so much space. I’ll work on it! Thanks for the inspiration. Completely adorable! You hit this one out of the ballpark Donna! I have a similar pan that is ages old in antique crackle white. Hmmm. I am a HuGe fan of your design style. I was wondering if you have any tricks for finding the treasured ‘junk’ you find. I visit flee markets and antique shows when I can. Thanks Lisa! It’s a total hit and miss game. You just look until you find something you love and take it home. Even if you don’t know where it’s going yet. 🙂 I stockpile so I can create on a whim! Happy New Year! The bathroom looks awesome! Thanks for sharing. You could put a little ladder on the bench against the wall or in the catercorner. Just an idea. 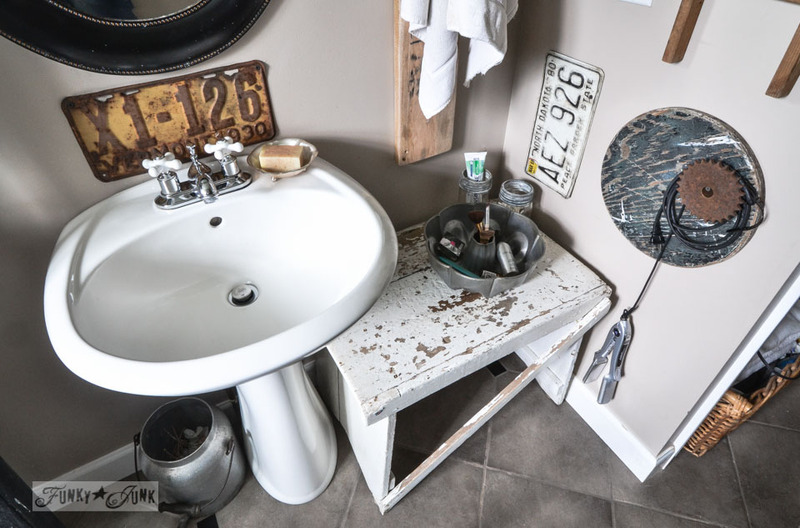 Great repurposing of the bench and pan for your bathroom. 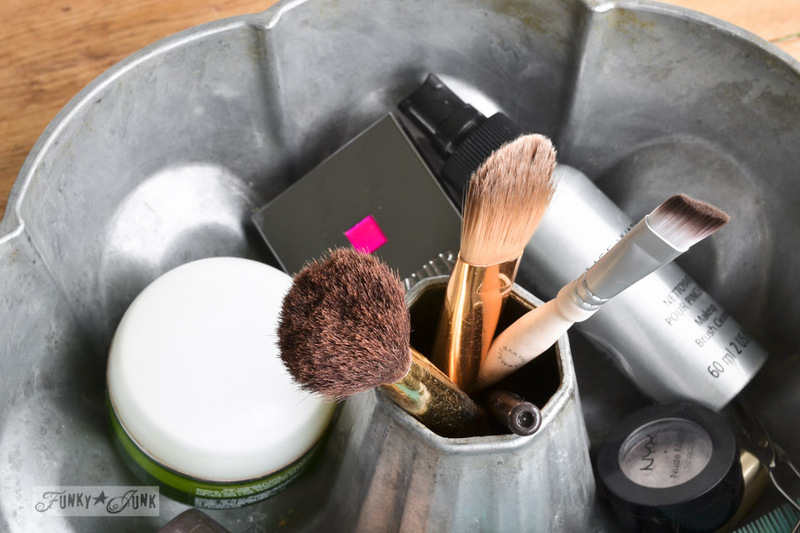 I’m currently using a footed milk glass bowl for my makeup and milk glass cup for makeup brushes. 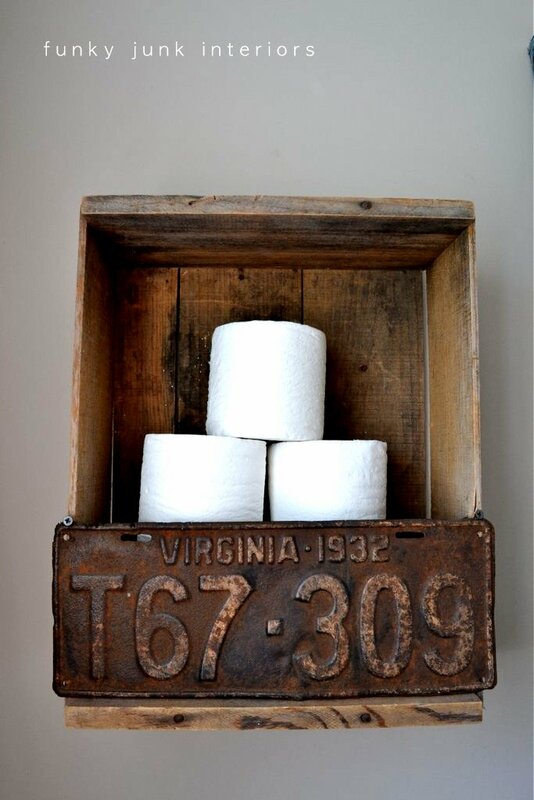 Vintage pieces add great character and come in really handy for bathrooms without lots of drawer space. Wishing you all the best in 2014, Donna. That was a cute way to upcycle some of the things I might have passed up. I feel a little recharge to get the juices flowing. Thanks. I like the little bench there. Just a thought, rather than building a new one, could casters save this one, bringing it up to a better height for you? I soooooo LOVE your site :-)!. I had a great idea for your mason jar chandelier that you beautifully hung with string. I did this project for my back porch, as I live on a 1/2 ravine lot, in a little log house. I took a bycicle wheel, and painted it with Annie Sloans chalk paint, and painted it in a robin eggs blue, and hung the string from it…BEAUTIFUL! !, then I also wrapped some beautiful vines around it, and took some old fashion metal ice-cream cups….you know…the ones with the necks on them, and squeezed them in between the spokes and placed a candle in each one, and vualla???….GORGEOUS!. Thank you so much for inspiring me. YOUR AWESOME!!…HUGS. You never cease to amaze me! Such a brilliant idea using the cake pan! I think I have commented on this before but what the heck. I love it. The ladder, the window, the shelf, the Bundt pan, everything! Looks like I haven’t. Hmm.. I remember this one so vividly. You are always an inspiration Donna. Pinning it. Donna you never fail to amaze me with your creativity. I love how you see things. You have perfected the art of repurposing. 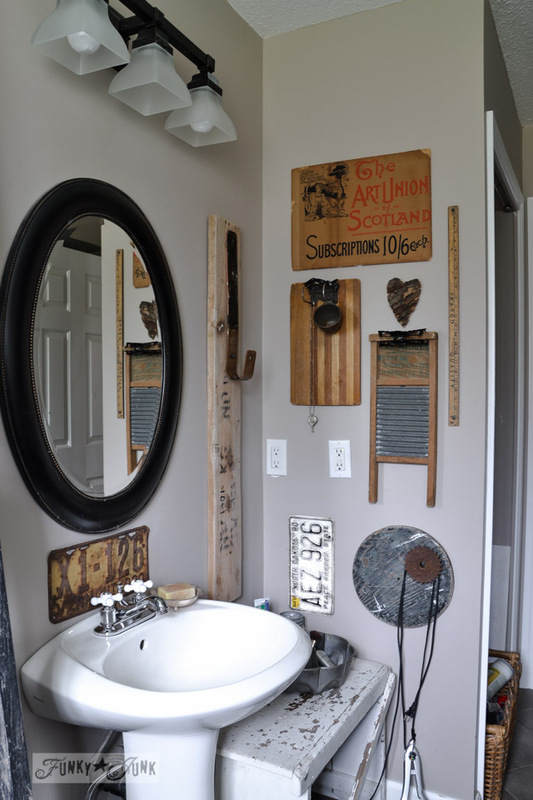 I love the creative way you’ve accessorized your bathroom. I have my grandmother’s bundt pan in my basement and knew that one of these days I’d see a creative idea for using it. I love how you used your for makeup. 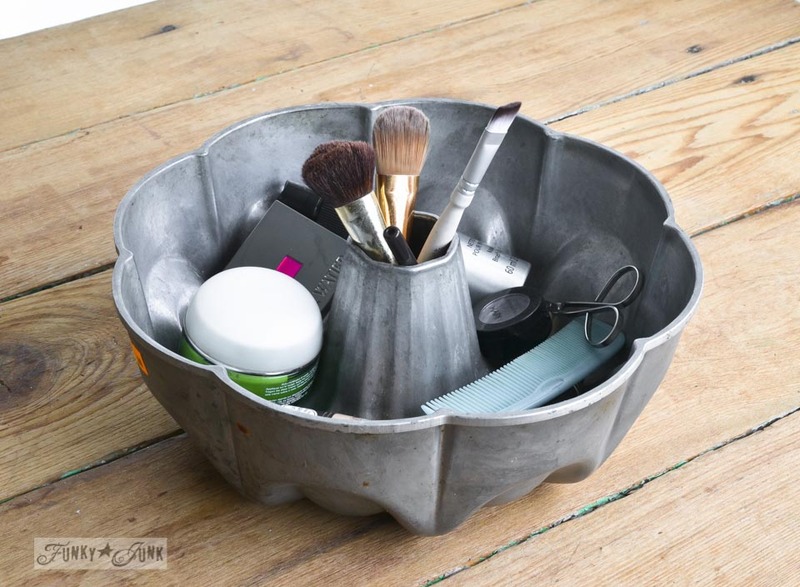 LOVE the cake pan organizer…it’s so perfect for your makeup. For a small bathroom as mine these ideas are really problem solving! Thanks so much for the lovely ideas! Just what I was thinking when I saw your post! Lovely, just simplistically lovely! Good job!